Holborn 0130 British Sub-Aqua Club has been going diving for over 50 years. Below is a brief overview of the club which should provide all the information you need to decide if we are right for you. If you can’t find what you are looking for please feel free to contact us and we’ll do our best to help. We meet every Wednesday evening at the Oasis Sport Centre in Holborn between 7:00-9:00pm and then at the Bloomsbury Tavern (upstairs room) from 8:30-11:00pm. We hire a pool at the Oasis where we run various training courses and where members can swim for free as part of their membership. Afterwards we have a club meeting where we discuss recent and upcoming dive trips and all things dive-related in a friendly, sociable atmosphere. We have a range of members all with varied interests so we try to cater for everyone. 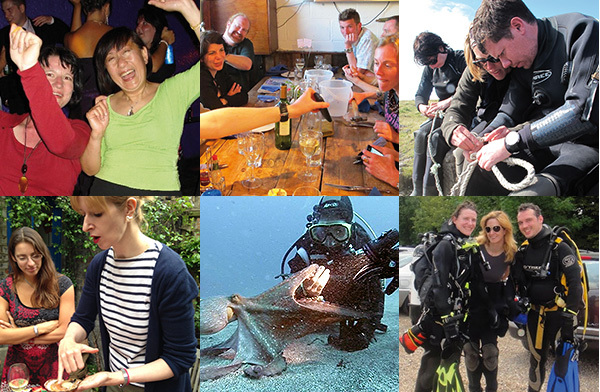 The dive season in the UK typically runs from April through to September and we aim to get out every weekend if we can. Wrecks are plentiful around the UK and are always popular but we also enjoy scenic diving on the many reefs around the coast. We have quite a few keen photographers in the branch and even a few technical/ rebreather divers. Basically, we are up for pretty much anything if it involves jumping in the water. Take a look at our Dive Calendar here. Being based in central London most of our members tend to be professionals who work nearby. This being the case we have always been open to anyone and everyone. We currently have about 70 members who come from all walks of life, are of all ages (minimum age for diving members is 17), from every diving agency and with every level of qualification. We have a near 50/50 split between male and female members and a very international feel. At last count we had members from Ireland, Italy, Germany, France, Belgium, China, Taiwan, Spain, Serbia, Australia, Finland, Bulgaria, Venezuala, New Zealand and, of course, the UK. We even have a Luxemburger (yes, that is really what they are called). We have a 6.5m RIB (Rigid Inflatable Boat) which we keep on the south coast, this year in Littlehampton (April to June) and Poole (July to September). So a typical dive weekend will begin with us meeting at the marina and getting ready to go diving. Most people drive down on the Saturday morning and we do our best to share cars and give lifts to those who don’t drive, splitting the cost. When everything is loaded onto the boat we’ll set off for our first dive, usually one of the many wrecks nearby to take advantage of slack water (when there is the least current). After our first dive we return to the marina to change tanks and for a spot of lunch at the café. In the afternoon we’ll set out for our second dive which will often be a drift dive along a reef. After returning to the marina and making sure the RIB is ready for the following day, we set off to our accommodation (usually a B&B) for a shower before heading out for dinner at one of the local restaurants. On the Sunday we will typically just do one dive (unless we decide to make an early start so we can fit in two) so that we can get away reasonably early to avoid the traffic heading back to London. Once again we’ll try to take advantage of slack water and dive another wreck. Doing just one dive means we can often head out to sites further away than we did the day before. After we have finished diving we return to the marina, put our kit and the boat away and usually have a relaxing sit down with some coffee and cake before we set off back to our respective homes. Typically a dive weekend like this would cost in the region of £150-£250 which would include transport, accommodation, food/drink and diving, although it is possible to do it for less. Kit hire would be extra (from one of the local dive shops, we can offer advice on this) although the club does have some kit which it is sometimes willing to loan out and other club members will often help in this regard. All our trips are run by club members (known as Dive Marshals) and a schedule of these trips can be found on our Dive Calendar. Please note though, only full club members can sign up for our dive trips. As well as weekend dive trips we will normally run one or two week-long UK trips per season. This often involves travelling to a location over a weekend, diving from Monday to Friday, and then returning the following weekend. Often we tow the club RIB or we can take advantage of the many diving hardboats that operate around the UK. Over the years Holborn has visited every corner of the British Isles, and one of the real pleasures of belonging to a club such as Holborn, is that we visit many places in the UK that you might otherwise never see such as Scapa Flow and St. Kilda in Scotland, Connemara and Baltimore in Ireland, Pembrokeshire and Anglesey in Wales and the Farne Islands, Isle of Scilly, Isle of Man and Lundy Island in the UK (and almost everywhere in between). Of course, we don’t just dive in the UK. Most years we will also run one or two trips abroad. In the last few years we have visited the Azores, Grunersee in Austria, Marsa Shagra, Dahab and Sharm El Sheikh in Egypt, Belize, Normandy in France and Nemo 33 in Belgium. Our club members are even more well travelled, with almost every popular foreign diving destination you can think of having been visited. So if it’s travel advice you are looking for, you’ll almost always find someone at Holborn who will be happy to give you a first hand account. Discover all the places Holborn and our club members have visited here. At Holborn, safety is paramount. Despite being one of the oldest dive clubs in the UK we have never had a serious injury. As the saying goes; ‘safety doesn’t happen by accident’, and this is especially true in diving. Whenever we go diving we are always careful to make sure that the less experienced divers are buddied with the more experienced; our club members look after one another. While you don’t have to be an Iron Man to go scuba diving, a certain amount of fitness makes incidents less likely and so we run various programs throughout the year to encourage this. Does this sound like the kind of club you would like to get involved with? If it does, then we would very much like to meet you. Whether you are a warm water diver who has never dived in the UK, or an seasoned cold weather diver with thousands of dives logged, we like to think we have something we can offer. Why not pay us a visit one Wednesday soon? We look forward to meeting you. Please fill in the form below and press send. We aim to get back to you as soon as possible. Holborn Sub-Aqua Club is run by it’s members for it’s members and as such aims to keep costs down as much as possible. In addition some trips/events may incur additional costs (mooring fees, accommodation, RIB towing costs etc.). Where possible these fees are determined before the trip/event and are divided equally between the attendees. 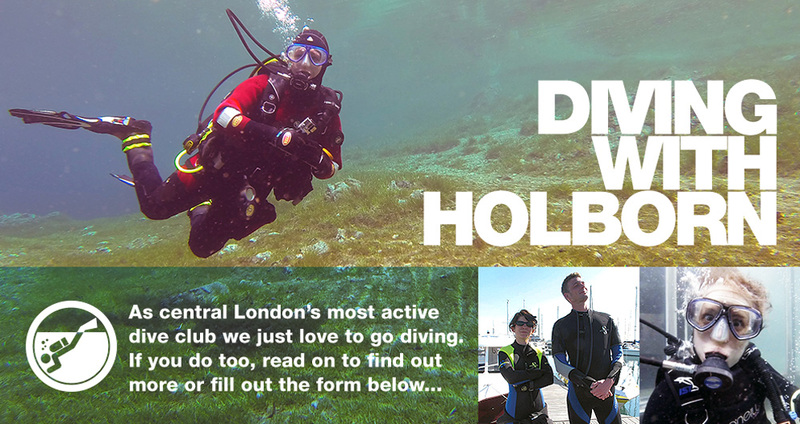 Holborn recognises core diving qualifications from most other SCUBA training agencies. In the majority of cases members are able to dive to the limits imposed by their original qualification. If you wish to continue your training with Holborn, your existing qualification would simply be matched to the nearest BSAC equivilent. Alternatively you can just continue to dive on your current qualification. The list below gives a rough indication of how BSAC core qualifications relate to those from other agencies. Not all the qualifications from other training agencies are as easy to match to a BSAC equivalent as those listed above. Also, matching instructor qualifications between agencies is more complicated. In addition, with safety our paramount concern, your level of experience is often more important than the actual dive qualification you hold. In all cases the final descision on anyone’s fitness to dive rests with the Branch Diving Officer. If your qualification is not shown here, if you hold an instructor qualification from another agency or if you simply with to find out more, please contact us.